Microsoft will be hosting a free (no registration required) half day virtual (e.g. online) Windows Server Summit Virtual Online Event June 26, 2018 starting at 9AM PT. As part of its continued focus on supporting hybrid strategy spanning on-premises Windows Server to Azure (among others including AWS) cloud based, Microsoft is preparing for the launch later this year of Windows Server 2019. There is no registration required, you can just show up without concern of getting email or other spam, however you can also click here to save the date, as well as here to get updates on the event. 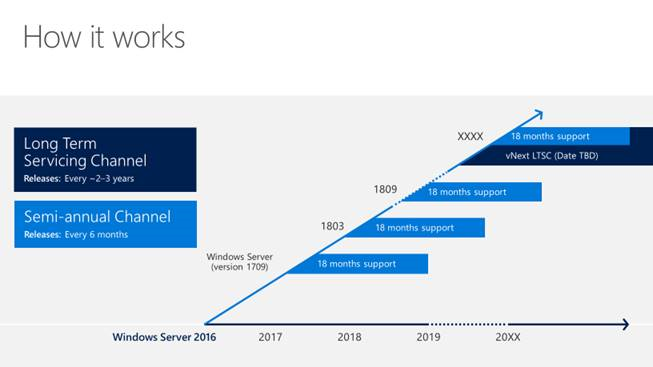 Windows Server 2019 is now in insider preview (get it here) and is the next Long Term Service Channel (LTSC) release following Windows Server 2016. In the past, Microsoft would have called Windows Server 2019 something such as Windows Server 2016 R2, however that has changed with the new Semiannual Channel (SAC) and LTSC release cycles. Keynote kick off presentations will be from Erin Chapple, Director of Program Management, Cloud + AI (which includes Windows Kernel, Hypervisors, Containers and Storage), Arpan Shah, General Manager of Azure Infrastructure marketing (Windows Server, Azure IaaS, Azure Stack, Azure Management and Security), and, Jeff Woosley Principal PM, Windows Server. In addition to the kick off presentations with current state and status of Windows Servers available for on-premises bare metal, virtual, container as well as cloud, there will be demos, Q&A, roadmap’s and much more. Topics will include new and recent functionalities such as Windows Server 2019, Windows Admin Center (formerly known as Honolulu), IoT, roadmap’s and much more. Security – New and recent security enhancements for Windows Server along with Hyper-V and other related topics. Application Platform – Containers and Linux support along with associated management tools for on-premisess and Azure. Hyper-converged infrastructure (HCI) – Leveraging software defined storage (SDS) with Storage Spaces Direct (S2D) in Windows Server 2016, along with Hyper-V and other technologies, learn how Microsoft supports HCI and beyond. Windows Server remains relevant today for traditional, on site, on-premises, as well as on-premisess along with cloud, container among other deployments. Remember to click here to save the date, click here to sign up for Windows Server Summit updates and learn more about the Windows Server Summit Virtual Online event here, see there, or at least virtually.